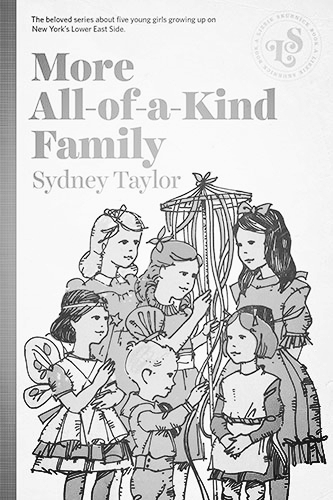 "All of a Kind Déjà Vu - An Essay by Adrienne Raphel"
In 1951, Follett published Sydney Taylor’s All-of-a-Kind Family, the first children’s book for a mass audience that featured American Jews. It’s been in print ever since. The Jewish tenements on the Lower East Side at the turn of the century glow with nostalgia; think Proust’s madeleine as a challah. Taylor’s editor worried that readers wouldn’t connect with the details of Jewish life. Exactly the opposite happened. The all-of-a-kind memories become readers’ memories. It’s déjà vu, or pre-jà vu, or all-of-a-jamais vu. All-of-a-Kind Family embeds itself in the mind by turning ordinary life into sacred ritual and de-mystifies religion by making it a ritual of the everyday. Consider Chapter Two’s tour de force set piece: the dusting scene. Even though the five sisters in the titular family––Ella, Henny, Sarah, Charlotte and Gertie––share one bedroom, somehow there’s a formal front parlor that is almost never used, as embalmed as Miss Havisham’s dress. Practically the only time the girls enter the holiest of holies is to clean it. One day, Mama hides a dozen buttons in the front room, which Sarah must find while dusting. As we follow Sarah around the room, each object that gets dusted arises into being before our eyes; as Sarah dusts, not only does Mama get a clean room, but we get the room built in our imagination. Button number one is under the big table in the middle of the room; two, on the back of a chair. Three is inside the piano cover, four’s on the keys: clever Sarah doesn’t neglect to dust the rest of the piano after she finds number three, and she’s rewarded for her diligence. Five is inside the little china shepherdess on the mantel shelf. Six: under a doily that is on one of two small round tables in front of the lace-curtained windows. Seven and eight are on the windowsills, and nine’s on the white window woodwork. (Between nine and ten, Sarah pauses for a moment to tear the sheet reading “November 1912” off the calendar; in this way, we get the date without breaking the action. I can’t help but see those forties and fifties-era films—Holiday Inn, or some such––in which the calendar sheets fly off to signal the passage of time.) Ten is in the second seashell Sarah picks up. Eleven is by the woodwork at the bottom of the door, and once she’s knelt to the doorframe, Sarah can find button twelve, under the second table, where Sarah had already found number six. Every button’s tenderly rendered and returned to Mama. The All-of-a-Kind books weren't my favorites when I was growing up. Favorites rotated frequently: The Giver; A Tree Grows in Brooklyn; To Kill A Mockingbird; I Capture the Castle; for a very brief, weird period, The Fountainhead. The All-of-a-Kind books go deeper: they aren’t my favorite books because they’re my life. The stories are lodged in my brain such that I’ve always sort of believed the all-of-a-kind family’s memories were my memories. The effect is the opposite of looking at a photo album of your own baby pictures. When you look at the baby pictures, you know intellectually that these events happened in your life, but you have to work to re-stitch the pale simulacrum of reality. I grew up more ish than Jew: Christmas Eve was our extended family’s major holiday; Santa came on Christmas morning; we lit the menorah at Hanukkah and hunted for Easter eggs in the backyard. I used the All-of-a-Kind books to forge a Jewish identity I didn’t exactly have. Yes, Purim, the holiday where we dress in costumes and bring noisemakers into synagogue. On Passover, we hide the afikomen. Succos is when we build the little magical house in the backyard. I never lied outright and claimed I’d actually performed these rituals, but I never needed to. The All-of-a-Kind stories aren’t replicas of my life: they’re in my DNA. When I was nine, my dad gave me a manuscript that a woman he’d known in college had written. She and her husband had both graduated in my dad’s class; now, they had five kids with a hyphenated triple-word-score last name. The white binder full of Times New Roman pages was a young adult novel about a family of Jewish sisters growing up in the nineteen fifties and sixties in an upper-middle-class, primarily Jewish suburb. I read it on the baseball bleachers. The only scene I can remember was at one of the sisters’ swim meets: anxiously nasal parents winding extra swim goggles around their fingers; the chlorine smell filling everyone’s noses and throats; one of the sisters violently vomiting across the smooth, white pool tiles. The book wasn’t great, but I understood it profoundly: this woman, too, shared the All-of-a-Kind memories. Given how widely the Lower East Side of the Progressive Era differs from southern New Jersey of the Clinton Era, or the upper-middle-class suburbs of the Eisenhower era, why does All-of-a-Kind Family present itself as memory to readers? Everything all-of-a-kind feels like something we’ve done before. Spontaneous adventures becomes instantaneous routines: transforming the immediate into ritual gives it the sensation that we’ve done it many times in the past, and will continue to do so for years into the future. The all-of-a-kind world never has the self-conscious quality of an ironic meta-life, live-tweeted as we’re living it. Each ritual must be lived fully every time, the first and the thousandth. Gertie and Charlotte dither over how to spend a penny in the candy shop, and the dithering is a ritual. Licorice drops are too identical, “chicken-corn” is too small; jelly beans have too much variety. Finally, they find the perfect “little people made out of chewy chocolate colored candy,” leave the shop, spend a penny on a bag of broken cookies, leave that shop, and stash their goodies till later. At bedtime, Gertie and Charlotte embark on their real ritual: the game of eating the candies. Charlotte comes up with a new, elaborate method to consume each sweet—counterclockwise nibbling, decapitation of the candy people, waiting five seconds between each chew––and once she imposes the rule, both the girls have to follow it to the letter. Gertie and Charlotte’s elaborately honeycombed hierarchies of nothingness were the same as mine. Growing up, in our basement playroom, my brother and I developed an elaborate world of Playmobil, little plastic figurines, each of whom we’d named. Blueface––my brother and I had scribbled blue marker on his face––was the leader of a gang called the Bad Boys, who devoted their time to turning the Playmobil world topsy-turvy. With Blueface at the helm, the Bad Boys always lined up in the same order: Blueface, Adam, Anthony, Todd, Michael, Billy, Joey, etc. A Bad Boy could only change his position in the hierarchy if he’d sufficiently proven his superior badness to the boy in front of him. The figurines stayed in the basement, but we’d also “talk Bad Boys.” Like Milton’s Satan carrying Hell with him, which way I fly is Blueface, myself am Blueface. We’d each take on several characters for elaborate six-way croquet tournaments in the back yard, with alliances and double agents. Our rules were arbitrary, but as soon as they were set, they were stone. One day, Sarah comes home from school in a mulish mood and refuses to eat her rice soup. Sarah’s contrariness immediately removes her from the rest of the family; instead of each individual girl reacting in her own way, the children become united in one brain. “The other children looked at Sarah in amazement; of course, they thought, she won’t persist in not eating this first course, so after a moment they stopped paying any further attention.” The rice lump congeals in Sarah’s plate like the lump rapidly growing in her throat, but until she gives in, the soup won’t go away. The sisters are sympathetic, but no one encourages Sarah to stay strong: “The children all felt sorry for her. They knew she was being silly but they could understand. Everybody felt stubborn once in a while. Charlotte whispered, ‘Aw, give in. Go on Sarah, give in.’” If one small rite of their lifestyle is challenged and overturned, the whole foundation will shatter. For want of a battle the kingdom was lost, and all for the want of uneaten rice soup. Taylor never veers into fantasy. Burlap doesn’t become silk, zinc isn’t platinum; one man’s trash is now Papa’s trash. And Taylor doesn’t hide the poverty. Papa’s hands are chapped and sore after sewing bale covers all day for the rags; Picklenose has to put a makeshift cardboard insert in his wet shoe because he can’t afford a new sole; Polack winds a piece of rope around his middle as a belt, and “the buttons on his ragged jacket had disappeared long ago so he used large safety pins in their place.” (Perhaps Mama could lend him a few—but never mind.) But tough times provide solidarity. When it rains, the peddlers can’t work, so they gather around Papa’s coal stove. If Mama’s hearth is the heart of the domestic household, Papa’s stove is the center of the working neighborhood. In All-of-a-Kind Family, structures overlap; patterns repeat. The girls are all of a kind, and the world is all of a kind, but this does not mean that it’s flat; rather, the whole world echoes the five-part layered sandwich structure the girls themselves represent. The sisters have their distinct personalities, to be sure, but they also function as a single structural unit, a five-planet solar system. 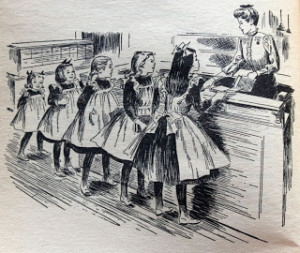 “A steps-and-stairs family!” the library lady says when she first meets the girls. “An all-of-a-kind family,” the sisters tell her. Taylor creates texture by closely overlapping layers that are very slightly but crucially different. 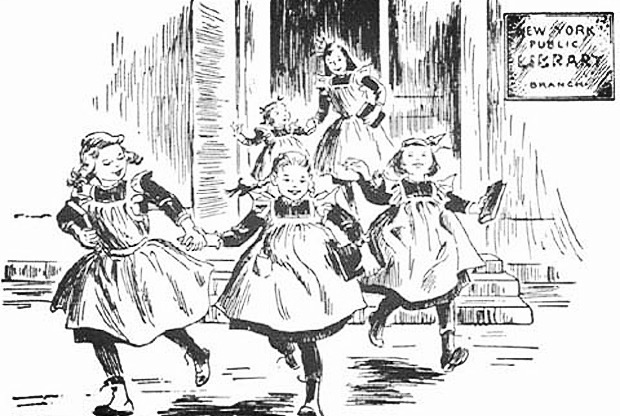 Three petticoats––flannel, cotton, muslin––each distinct, but each a repetition of the others. In the front room, the doilies topping the tables echo both the carpet covering the wood floor and the lace curtains in front of the window. At the market, there are three layers of sellers: pushcarts, stands in front of the stores, and the shops behind the doors. On the Sabbath table, Mama removes the oilcloth to lay down a fresh white tablecloth, places two braided loaves atop the table, covers them with a white napkin that mimics the white tablecloth covering the wooden table. Papa’s junk shop is a catalog of textures. Mr. Basch, the grocer, sells broken bits of cookies, all the flavors jumbled together in a barrel; though each broken piece of cookie is essentially the same, no two are identical. Each Purim costume has geological strata made of padding, stuffing, folding, looping and pinning. Henny, for instance, creates her character by pulling rags out of Mama’s scrap heap and pinning them over her dress: like a magician pulling more and more handkerchiefs out of a hat, Henny pulls out ripped petticoats and swaths of cloth to become a little old pretzel woman. The pretzel woman’s guise is another overlap: we’ve already seen the pretzel woman weaving around in the interstices between peddlers and shopkeepers; the pretzels’ loops are later echoed in the braided challah on the Sabbath table. The Coney Island Boardwalk repeats the street market: large, elaborate rides; smaller sideshows in front of the official rides; waves of people jammed together, with an internal logic to the chaos. Each story becomes an opportunity to explain a certain custom of domestic life, Jewish life, or both. In the first pages of All-of-a-Kind Family, it’s Friday afternoon, which means that the girls are eagerly getting ready to go to the public library, when in comes Sarah, the middle sister. “Between sobs, the muffled words came slowly. ‘My––book––is––lost.’” The lost Peter and Polly in Winter gives Taylor the occasion to paint the ritual of Friday afternoons at the library. Each girl searches through the stacks of the children’s section to find a book, which she brings home to begin reading after supper until the candles die down, because no light can be lit on the Sabbath. To the girls, the ritual of Friday afternoons at the library is no less sacred than the Sabbath dinner. When the lost book threatens to disrupt the physics of the library time, the universe teeters. Thankfully, the kindly library lady puts Sarah on a long-term installment plan––one penny a week––so over the course of a lifetime, the book will eventually be repaid, and all’s right with the world. When I was ten, my family moved from southern New Jersey to St. Johnsbury, Vermont. The Northeast Kingdom was an each-to-her-own-kind place: no one cared about keeping up with the Joneses, but there wasn’t the same sense of shared ritual. Most people lived out in the country, where they were their own closest neighbors. Vermonters developed idiosyncratic rhythms that become routines—this is the way things are, because this is the way they always were––but they didn’t need to create myths of their daily lives to understand their pattern in the world. In All-of-a-Kind-Family Uptown, the family moves up to the Bronx from the crowded Lower East Side, and the life loses some of its folkloric tinge. Not everything is a ritual anymore: sometimes, events are just one-offs. In the first chapter, Henny borrows Ella’s white dress and inevitably spills all over it. Instead of trying to get out the stain, she dyes the whole thing in tea to turn the white dress “ecru.” The scheme works, and Henny’s relieved, but she can’t help but feel increasingly guilty. When Mama confronts Henny, she’s relegated to doing the family wash for the week, but unlike Lady Macbeth, she finds that she can wash the sin from her conscience by coming clean. The tea-staining episode is an isolated moment in the family’s life: Henny’s peccadillo doesn’t threaten to shake the foundation of an established routine, and the solution doesn’t create a new rite unto itself. The girls’ Bronx lives are rich, but the rituals aren’t there. Partly this is a function of time, since the same thing happens to other children’s book heroines who grow up. The young Anne of Green Gables’s mythic imagination gets replaced by Anne of Avonlea’s social fascination and Anne of the Island’s romantic life. But part of the de-ritualization of the everyday comes with this move from the packed, impoverished, but richly interwoven Lower East Side to the spacious Bronx. In a place where the family can breathe and come into its own, the girls can flourish and grow into their adult selves, but the sense of ritual that gives the family its rich mythic quality is lost. We still relate to the stories, but because they exist as moments in time, not as rites, they don’t become our memories. But memories have a way of making lives of their own. In All-of-a-Kind-Family, the lost library book, Peter and Polly in Winter, is never found. But Sarah could never have lost it in the first place. All-of-a-Kind-Family begins at the end of 1912. Peter and Polly in Winter was published in 1914. Sarah has lost a book that won’t even exist for two years. Peter and Polly in Winter is one of a series of four––Peter and Polly in Spring, Autumn, Winter, and Summer––based on a brother and sister who live in St. Johnsbury, Vermont. In college, back home during a school break, I went to the town library, where, having utterly forgotten the book that Sarah had lost, I found Peter and Polly in Winter, and remembered. Peter and Polly in Winter can never exist in All-of-a-Kind-Family, but it lives in the collective all-of-a-kind memory. Sarah knows about Peter and Polly, even though it couldn’t have been a book yet, but never finds it again; I didn’t know I was looking for Peter and Polly in Winter when I found it. My family’s holiday rituals are sacred, but the traditions are secular. Every year, we gathered for Christmas Eve at my grandparents’ house. It was the compromise time among the Jews, Catholics, Episcopalians, agnostics and atheists. One year, my cousins and I trooped next door to see Chipper, the Irish neighbor, where Christmas Eve was much rowdier than our teetotaler affair. We didn’t realize just how jolly St. Nick would be. That year, we drove home to light the luminaria earlier than usual; the only new routine born was our yearly impressions of Drunk Santa. On Christmas Eve, my cousins and I played hide and seek. Just as Sarah learned the front parlor by finding the buttons, we learned every crevice of the house by figuring out how to get lost. The classic hiding spots were on the third floor, because of the little pockety attic spaces. My favorite was the window nook in the bedroom where the flowered bedspreads matched the flowered wallpaper, and the flowers slanted over you as you slept, so you were slanted into the emeralds and pinks and blues; the floor was covered in a green thick curly shag rug, so when you curled into the window you could tug semi-methodically at loops in the rug to make slightly bigger loops. Another good place was the prison, or the little bedroom on the third floor that had been an unfinished L-shaped attic crawl space until my grandmother decided that it should be finished as a bedroom for children. The prison had two beds built into the walls, barely half the size of a twin between them; by the time it was completed, we’d all outgrown the beds, and the framed baby snapshots on the only non-slanted wall didn’t look like us anymore. The basement also worked well; my grandparents had turned it into their office, which meant we all clustered down there to play computer games. If you remembered about the laundry room, you could find a grimly overheated insulated corner, the only gritty corner of the house left (or you could hide inside the dryer, and pretend your parents never knew). On the other side of the computers were the vaguely chemical darkrooms where my grandfather’s slides and old carousels were stored; in the eighties, he’d toured Europe on the business-speaking circuit. The second floor also had good crevices. Uncle Steven’s little twin bedroom, with the TV mounted into the corner like a security camera. The bathroom that had a claw-foot tub but no shower, where the chandelier that had a few blue opaque teardrop-shaped faceted gems dangling down, and the nightlight shaped like a blue candle, so you could hold the door closed with the doorstopper stone and still sort of dimly see. The only bad place to hide was the main floor, where our presents gleamed under the golden octagonal clock that sometimes told the right time. A year ago, my grandparents moved out of their large house into a two-bedroom condo, a few blocks from the buildings where their parents had lived at the end of their lives. On the last day my grandparents owned the house, I walked through all the empty rooms, with the new, strange echoes; no buttons here. I went into the crawl space prison bedroom on the third floor, into the corner of the ell where the two slants of the roof meet, and on the floor were a small pile of plastic circus lions and blocks, that either had been there for years, since the youngest grandchildren were thirteen—or they’d been there for a week, since our cousin had brought her three-year-old and one-year-old to Christmas, but they hadn’t slept on the third floor, hadn’t gone up there, to any of our knowledge. Or they’d been there since the summer, when the caretaker had brought her nieces to play—or they’d been there forever. We left them, but not the clock, for the new owners. "Along the longest wall was the buffet where the top drawers held the silver, beneath were drawers for table linen, china, and crystal. On the opposite wall were two very large windows, beneath which was a very large wooden chest where pillows, colorful shawls, and blankets all woven by hand were stored. In the right hand corner was a knick-knack cabinet with little figurines of all description, that was a favorite with grandma and me. She would let me handle them sometimes by giving me a dustcloth, and I would help her keep them clean and shining." Ida proto-inhabited Taylor’s world: Ida’s memories are Taylor’s memories are mine.